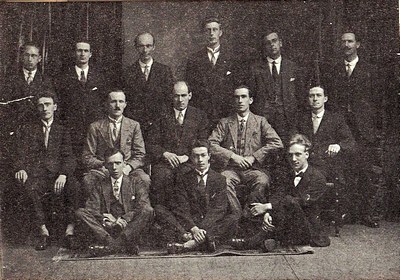 The choir circa 1923. 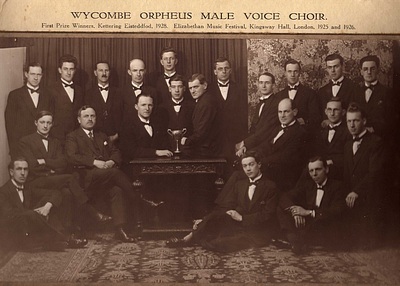 This is the first known photograph of the Wycombe Orpheus, and Mr. Bromage-Smith, its first musical director, is in the centre of the middle row. In the latter part of 1922, male members of the congregation at Westbourne Street Church discussed the idea of forming a local male choir, drawing its membership from the High Wycombe area. At that time, churches and chapels flourished and their choirs were never short of members because singing was an integral part of community life. Following exploratory discussions between choristers from Hazlemere and Westbourne Street churches, the nucleus of a male voice choir was established under the expert guidance of a highly regarded local musician and conductor, Wilfred Bromage-Smith. Two shrewd and persuasive gentlemen who were determined to turn a dream into reality - Ted Barrington and Cecil Lacey - had cleverly manoeuvred him into ‘volunteering’ to become the inaugural musical director. John Harris was the first choir accompanist. From a core of eight, membership of the choir had grown to 12 by the time it gave its first concert in February 1923, and in recognition of its growing reputation, the number of concerts given in the first year had risen to 15. Evening dress was the chosen choir attire for public appearances, despite public transport being used extensively to get to choir engagements because few choristers had cars. The choir MD deliberately decided to enhance its reputation by competing regularly in choral competitions from 1924 onwards. Competition success led to invitations to participate in numerous radio broadcasts, and collectively, these events helped to develop a distinctive ‘Orpheus Sound’. This beautifully posed photograph (no smiling!) typical of the period was taken circa 1928 and celebrates the choir’s competition successes. Mr. E T Barrington has his right hand near the cup, and Mr. C Lacey is the tall gentleman in the back row.